Pros: Fair solid lines requiring a variety of shots to score well. Great Baskets on every hole. Holes with fly pads are in good shape. Mix of par 4s and 3s. Ability to play a quick 9 loop or a full 18. Lots of fun lines and shoot during play. In season bathrooms near first hole. Cons: Holes without fly pads need them. Layout can get confusing if never played before. Lack of tee signs and next hole arrows. Not really any seating along the way (couple of rocks and stumps here and there). Other Thoughts: SK (Curtis Corner ) will test your ability to keep your lines tight and land in areas to set up your approach shots. Final run of holes will test your arm and ability to air things out. The water hole on 14 seems like an easy throw out into a field with the OB on the left, but...I've seen good players dump a few in that pond, so believe in your throw and let it go! This course has made vast improvements over last few years, with the community of players always looking to increase the experience of playing here. Come on down beyond the tower on RT1 and let it rip in RI. Pros: The signage was very good although I am not sure where the 17 tee actually is. There is a stone dust mound that looks like a tee, but there are markings on the bike path that indicate it might be there. We brought some first timers with us and we had a great time. Cons: Everything was trimmed on the fairway but the rough could be very thorny. Especially the 7th hole right of the tee 50-75 feet on the left between the fairway and the field. Be warned leave the disk.... save your skin. Pros: If you played Ninigret and bragged that you played every course in Rhode Island, you've got more work to do. There is some terrific variety, especially considering how New England courses tend to feature only wooded holes. Holes 16-18 are pretty open holes where the main danger is the sidewalk OB. Hole 14 is one of the best holes, a tricky shot over water where a strip of land is the fairway for the first 300 feet or so with water to the left and OB woods to the right. You either need to bomb past the it all to the wider area after 300 feet or throw a careful but reasonable placement shot. This was a great tournament hole with good score separation. The wooded holes have a good range of distance and use the elevation changes very well. Hole 2 is a fun steep uphill bomb. Hole 10 is a long uphill drive with gentle S shape that demands long placement shots to card the 3. Hole 13 has a placement drive around a 90-degree dogleg right before hitting one of the only tight fairways. There are a lot of lines, but if you clip a tree, you're in the briars. Oh, and there are at least four aceable holes. Navigation was pretty easy, although I played in a tournament and don't know how permanent the "next tee" signs are. Cons: A few of the tee pads are unfinished and natural, including one that is still on an incline (hole 12?). Tee signs are on about half the holes. Briars are mostly cleared out of the front side of the course but can be really bad on several of the holes around the lake. If you go off the fairway, it's really easy to take a step and realize too late that you have thorns around your ankle. Ouch. Other Thoughts: This is a much needed addition to a state that is curiously lacking in courses. The full 18 baskets were just recently completed, so bear in mind the previous ratings are underrating the current course. The tournament was today, and the course was looking fantastic for it. All holes have been cleaned up very nicely and the back 9 are immensely better than they were before. It was a great tournament. - Good mix of holes, elevation changes, etc. Other Thoughts: The tournament was fantastic, thank you Matt, Norm, Tim, and everyone who helped. The course has improved a lot and is much better. One of my favorite courses, great for beginners and experienced players. Pros: 10 holes playable right now with good baskets. Mostly wooded course with solid lines on most holes and some tighter lines on others. Good mix of lefty and righty lines as well. Most holes reachable with clean drives for birdie chances. The elevation available to the designer was utilized well. Good for teaching new players. Open field on other side for practice before/after round(s). For a relatively new course, it was well manicured. Bathrooms on site and clean. Cons: I can see why there is so much OB here. The walking path comes into play on quite a few holes. While it didn't seem like it was heavily used when I played, players should be alert for walkers nearby. There is a double mando on hole one, and I am never a fan of unnecessary mandos. Granted, that is the line you want to hit, but it seems forced more than it is a must have mando. The one on four just seems overexcessive too. I see why the designer put one there (the walking path), but just play the path OB. Mando forces new player to hit seven foot gap, pretty tough even for a player with some experience. Other than that, everything else is okay. Other Thoughts: I played this course for a tournament yesterday and there is high potential here. There are great plans in place for a playable 18 before the end of the calendar year, and a crew led by course designer Jimmy Blakeney are working hard. Potential holes include an island green and a signature hole over the same lake with OB right as well. 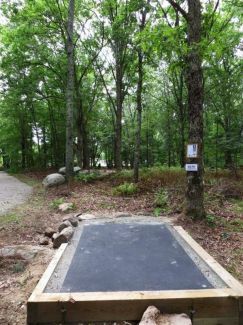 Right now as it is, South KIngstown DGC is not a destination course, but with some more time and pruning, plus the installation of these other holes, it will be worth your trip in 2016 should you be passing through Rhode Island. Pros: -Good signage, kiosk has course map. -Ample parking with bathrooms and water onsite. -Great lines on most holes. Clearly defined fairways with challenging gaps to hit. -Good directions from basket to next tee, easy to navigate. -A couple great holes, 3 has a beautiful rockwall guarding the green after a nice wooded fairway. 8 uses the elevation and treelines to create a fun dogleg hole. Cons: -Some poison ivy and thorns, hard to hold this against the course as they are so pervasive in the Northeast. -Only 10 holes, give me 8 more of the same and this would be a great course. -Some tee pads are uneven even though they look relatively freshly installed. Other Thoughts: I enjoyed all the rounds I played at this course and will definitely be back if I find myself in the area again. Most of the holes are great lines and fun to throw. I love the New England look with lots of boulders and rock walls. The best short course (sub-18 hole) I've played so far. Plays very quickly - I shot 27 holes in under 2 hours. Nice setting, scenic, similar to the eastern New England courses I played (ponds, trees, rocks, some elevation) but on a smaller scale. Cons: Hole 1 is next to a building - potential for hitting the building, even though the hole is very short. Very short course- needs 18 baskets or alternate tees, etc. Other Thoughts: Visiting Providence, RI from Georgia and played several courses in the area. This was the only one I played in RI. Drive down from Providence was easy. It was very quiet and peaceful when I played. I think the last five holes are the best. Hole 1 is really the only hole I didn't like. I think there are several opportunities for aces (1,4,5,7). I would play it again if I were staying nearby or passing through. But, if I went back to Providence, I would go to CT or MA over this course. Pros: It is a disc golf course, and that is the main thing you want more of if you're an Ocean State native. I wanted to play a round in Rhode Island on my quest to disc golf in all 50 states, and Ningret isn't winning over many of our DGCR contemporaries. As daylight was fading fast when I arrived at South Kingsdown DGC, 10 holes is about all I had time for. The length is usually short, measuring 2829' in total distance, and only one par 4. Elevation change is not completely absent, but not extreme on any hole, either. There are nice fairways, cleared out of woods and providing a good path to each DISCatcher target. Layout was good, mixing in lefts and rights, with some distance occasionally. The pin placements were chosen well, and used the terrain very well. The tees are rubber mats installed nicely on leveled surfaces. Each hole has a nice new sign. Some cool old stone walls intersect the fairways on a couple of holes. This is a quick and easy to navigate course if the sun is up. Cons: There was some growth fighting to regain its territory on the recently cleared fairways, and briars and poison ivy reached for my legs. I would think rough can get ugly if you get a bad ricochet off a tree in the wrong place. There are places where the course may be close to other people in the park not playing disc golf. There is a walking path winding through, and a play ground kind of near the first and last holes. Not the most challenging course, and only 10 holes. My smartphone parked me in a residential cul-de-sac, and my dog and I walked in the back entrance to the park. Not sure, but there must be a better place than that to get in. Other Thoughts: South Kingsdown DGC is a compact course in a pleasant park, and I am sure the locals are glad to have another option in state. It is fun, and I only managed even par (28), scoring a bogey, a double bogey, and three birdies. Wish I hadn't had to rush to beat the sunset. The kiosk and all of the equipment is brand new and nicely installed. If 8 more holes are installed, and they are consistent with the quality of the first 10, I could see boosting my score to a 3 rating easily. Pros: -A great resource for an area without many disc golf courses. My experience here was WAY better than Ninigret Park, the only other course in RI to my knowledge. -I played a solo round in 23 minutes without rushing, including the time to walk to and from the car. Verys hort walks between all holes and parking lot make for quick, fun rounds. -They squeezed the holes in perfectly on to the course. They don't intersect and they keep a safe distance from one another. -I like that they did 10 rather than the traditional 9. If you've got the space, use it! -An array of shots. A couple dog-legs right. A couple dog-legs left. -Nice use of scenic stone walls. -There are lots of trees, but they make the course challenging and fair. Every hole has clear fairways and you don't get punished if you throw it straight. -Navigation was pretty easy going solo for my first outing. -Nice kiosk in the parking lot with map and sponsor info. Cons: -Underbrush has thorns. Yowch! -It took me 5 minutes to find the first tee. After that navigating was easy without a map, playing solo for my first time. -There's no "wow" factor to the course. When a course has 10 holes and no "wow" factor, a 3 rating is pretty darn good in my book. Other Thoughts: I played 3 rounds in about 80 minutes. I loved the experience. There's nothing spectacular about the course, but they did a great job with it. If you come, be prepared for lots of trees, but all the fairways are wide enough to keep things challenging and fair. Hole 1 is a nice warm up hole. Anny RHBH through a gap to the pin. Potential birdie. Holes 2 and 3 start to work the arm on straight shots that make you pick a line and nail it. Hole 4 is dog leg left around a bunch of trees. Hole 5 is a sweet shot that will challenge how straight you can keep your disc. A great hole. Hole 6 is a beast. Lots of trees and distance makes for a hard par. Hole 7 has a couple routes to choose from. Pick one and nail it. Hole 8 is a sweet dog leg right. Felt so good nailing a birdie. Holes 9 and 10 are like the others: a couple options, a bunch of trees. Challenging and fair. For improvement, build some more holes, get down all the rubber tees, and get rid of all the thorns. Oh, and put in beginner tees so we can turn more locals onto this sport. I travel to this area to visit my in-laws. I will play many rounds on this course every time I'm in town! Rhode Island Where have you been! Pros: First I must profess that my excitement for the opening of this course is particularly high. As a native of Rhode Island (now living in South Carolina) I have been anxious to see some signs of local disc golf growth in the state. Ninigret Park remains a worthy course, but an addition is warmly welcomed. - While there is only one Par 4 of the ten holes installed, many of the Par 3s are long and tough. Plus the course is mostly wooded, so accuracy off the tee is critical for good scoring. It is a course that requires ~950 rating level play to break even par from my first impression. Easiest holes from recollection were 1, 4, 5 and 10. I also thought the course was a good balance between being an honest challenge to skilled players while not being overly brutal to newbies. - I really liked the elevation profile of the course. Only 1 moderately steep uphill (hole 2). Otherwise the course has some nice ups and downs with some really good pin placements. - There is a network of old stonewalls that frame many fairways adding some great overall character to the course. I believe many of the walls play as OB boundaries as well. Reminds me of Borderland State Park, One of my favorite courses in MA. - The tee signs/pads and baskets are all nicely done. They were actually working on the teepads while I was there which was exciting to see. - From reading different articles in the local paper, they have done an outstanding job securing course sponsors. I was really impressed and glad to see the local business community support this. Cons: - It is a relatively big park, so at first I had a difficult time finding the course. Once I got my bearings the parking lot was central to several tee pads and the hole sequence itself was easy to navigate. - There was some poison ivy on 4-5 holes so watch out for that. It appeared that they were trying to remove it (not a fun course maintenance task). - There is a walking path that cuts through the course in 2-3 different places. The course designers did a good job with tee and basket placements where this should not be a big issue. Watch out throwing long on hole 1, and way left on Hole 5 otherwise you are fine. However, the path was busy so do be careful. - I am glad it is in a busy park, because I think it can provide a lot of exposure to disc golf to Rhode Islanders(disc golf is still very foreign at this point). However, I did get mixed feedback from people I came across while playing the course. Most were very friendly and intrigued, however I did come across a few who were very negative. Not sure what their specific issues were, but I did my best to give them my disc golf sales pitch. I just hope there is no us against the disc golfers mentality develop here. Other Thoughts: - I am incredibly curious about the layout of the remaining 8 holes. It looks like there is some areas in the park with more open space where they could hopefully add 1 or 2 more par 4s or even a par 5. It would be awesome if they were able to fit in a legit Par 58 course. Either way, I have a lot of confidence that the remaining holes will be well designed based on the installation of the first 10. - Maybe I am missing it, but I would love to see them develop a stronger social media facebook presence. It would be great to join some locals on a league round whenever I am back home and really build a club presence at this course. - I guess my ultimate hope is that this becomes a model course Rhode Island can point to and inspire the development of a few more courses in the state. Time will tell, but this course is a huge addition to the area.